For watch collectors, the more elusive a piece is, the more you want it. Indeed, just a few years ago, your worth as a collector was measured by your most complicated and rare watch. But that’s changed. Today, the jewel in your crown is likely to be simple and steel. With the oversupply of high-end watches and subsequent discounting, buyers have gone after models with lasting value and watched as their financial appreciation soars. These grails are now so hard to get, it often takes more than money to buy one. So consider us your man on the inside and follow our tips to get your hands on these horological beauties. When Francois-Paul Journe introduced the Chronometre Bleu in 2009, it was meant to be the accessible entry to the brand following the global financial crisis. But the watch was difficult to make and demand quickly outstripped the ability to make them. The case, made in rarely used tantalum for its blue-grey colour and scarcity, was a nightmare to machine – it was prone to surface porosity and dulled tools. The mirror-polished blue dial also has a 65 per cent rejection rate because of its flaw-revealing surface. Recently, two trays of finished dials at the factory – nearly a year’s production work – were dropped on the shop floor, further retarding deliveries (and perhaps supporting prices). While most F.P. 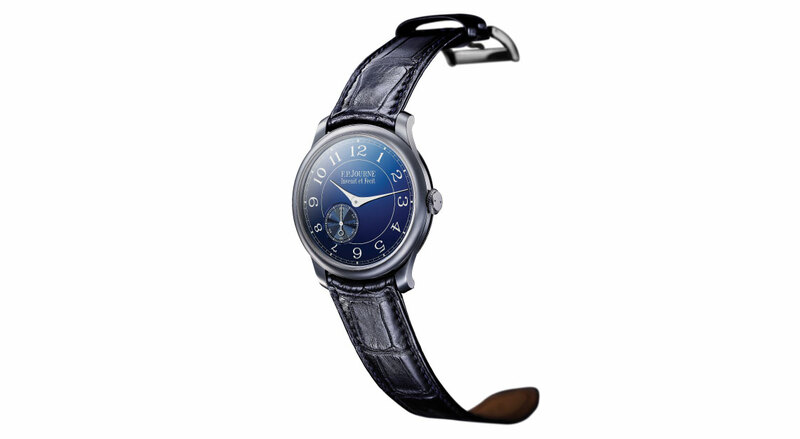 Journe watches have idiosyncratic qualities, their character is essentially traditional. The tantalum case and eye-catching quality of Chronometre Bleu give the watch a modern cast that has wide appeal. The resale value is now hovering around US$5,000 (S$6,734) more than its US$23,300 (S$31,382) retail price. Because these do trickle into boutiques and independent retailers, Chronometre Bleu is not impossible to get. Word from inside the company is that François-Paul Journe loves the watch, making its demise unlikely. With so much time and creativity spent on the wildly imaginative Horological Machines, it was a pleasant surprise when northern Irish watchmaker Stephen McDonnell revealed his first movement prototype for what would become the Legacy Machine Perpetual. It is the beauty of this movement, housed under a bold bubble sapphire crystal, that has generated the loudest clamour among collectors. Most pieces are sold before they enter the store and have been virtually impossible to locate on the aftermarket. Legacy Machine Perpetual seems to satisfy the desire for a traditional complication as well as a need to wear something more flamboyant. The popularity of the offbeat watch has increased as the company has added coloured editions. The policy of releasing iterations in small quantities – the watch was launched with two editions of 25 pieces in rose gold and platinum – created quick sales. 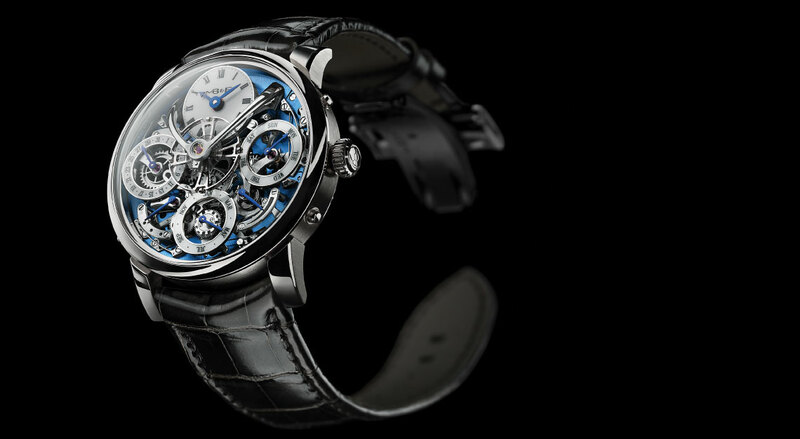 Subsequent coloured editions within the US$148,000 (S$199,269) titanium piece and the US$155,000 (S$208,694) white gold piece are still being delivered, but never sit in stores. Some retailers still have pending deliveries, so they remain your best option. Legacy Machine Perpetual has been Max Busser’s most popular watch, but he is unlikely to ruin its collectible status by making too many. The automaton watch is the natural evolution of mechanical watch appreciation, eschewing functional sensibility for something that is simply expressive, beautiful, and fun. 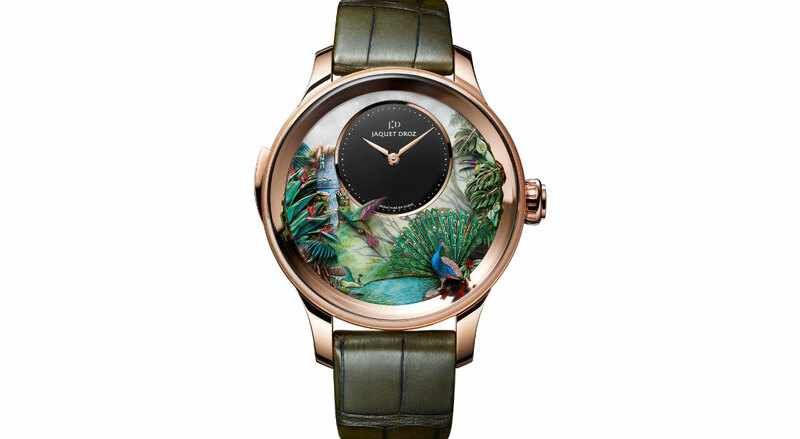 Jaquet Droz has been releasing editions of its Automaton line since 2012, but the Tropical Bird Repeater is remarkable for the sheer scale of its animation. The whole scene – including exquisitely fashioned hummingbird, dragonflies, peacock and toucan – will come alive. The hummingbird’s wings are particularly remarkable, beating up to 40 times a second. Moreover, the watch is also a minute repeater. Minute repeater, an incredibly complex automaton, intricate hand-decoration – any one of these attracts the eye of the collector, and here you have all three. Complications – artistic ones, especially – rarely get this ambitious. Since this watch is limited to just eight, the secondary market is unlikely to prove fruitful. Prospective buyers will probably have the most luck at Jaquet Droz Boutique at Marina Bay Sands, where they will find it retailing for S$1.05 million. Jaquet Droz is a name indelibly associated with masterful presentations in the art of mechanical movement. This is a reputation that will not fade any time soon – not that it matters because pieces like this tend to speak for themselves. The full story is available in the February 2019 edition of Robb Report Singapore; get the annual print subscription delivered to your doorstep or read on the go with a digital subscription.